I became enamored with glass back in the early ’70’s when I first saw an article in McCall’s magazine of crafts. Stained glass called me but I didn’t have the first clue where to look to get started. It was several more years and a move to Wyoming that finally put me in contact with a teacher. One class and I was hooked. I spent hours and lots of money I really didn’t have learning the skills required to actually create something worthwhile. My first craft show taught me something about the generosity of people. My pitiful little offerings were … pitiful, LOL. But people bought them anyway. I have to tell you I almost didn’t go because I was just terrified. It’s a good thing I did because that one little show kept me going and determined to get better at what I was doing. I did a lot of shows after that. Hubby always encouraged me in my creative endeavors and he even built a “booth” for me that I could easily knock down/set up all by myself. Some shows I did well, others were a bust but I learned something from every single one. I moved my “studio” out of our small spare bedroom and out to a huge space in the old railroad depot. I barely managed to eke out the rent (which really wasn’t that much for over 400 square feet) but I felt “professional.” I tried my hand at fusing, leaded glass, copper foil, suncatchers, full size panels, and anything else I could think of. Then glass beads caught my eye. Seed beads at first, and I taught myself the rudiments of beading when I wasn’t making something out of stained glass. And then … oh cruel fate, I read about a group of glass artists out in Washington state who were making glass beads. Well. I had long harbored a desire to melt glass. My first exposure to such a novel approach to glass work was when I was 16 and visiting my uncle and his family out in California. They took me to DisneyLand where I watched with total fascination while a young man sculpted the most amazing things by melting glass with a torch. I still have the small glass swan pendant my Aunt bought for me that day. Years later I ran into this man in Arizona. Talk about a small world. He was now making beads and had a small shop. Of course I HAD to buy a new piece and they now both sit in my curio cabinet. My adventures in melting glass were postponed however, as things usually are. I had to move my studio due to conflicts with the people who owned the old RR station. I found a smaller place but it was hidden away and no one knew I was there. I stayed about a year and then was forced to move everything back home when that building was sold. And then WE moved. In 2001 I found a listing online for a beginning lampwork class in Denver and promptly signed up. I fell in love with it the minute I lit the torch. I came home a few days later, several hundred dollars poorer but with a brand new torch and a bunch of glass rods. Somewhere or other, probably eBay, I found a used oxygen concentrator, moved my car out of the garage and set up a worktable. Our neighbor, who was a welder, set up my torch for me (very professionally, to be sure) and I was off and melting. 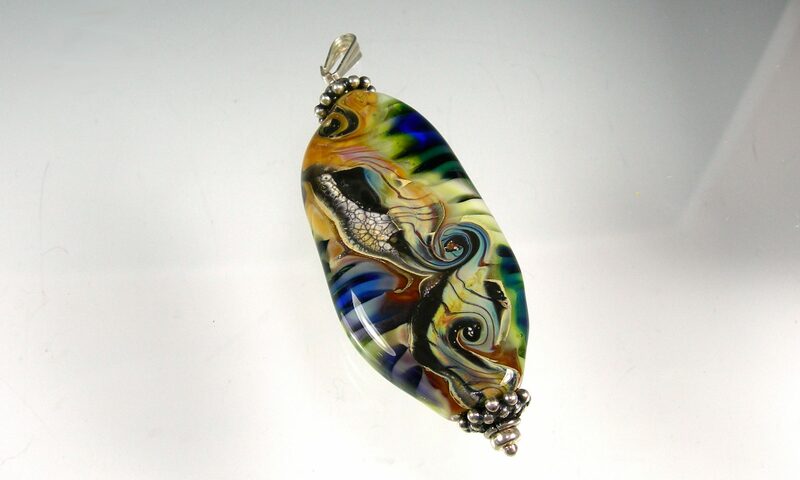 And then the bottom fell out of the eBay lampwork market. And worse yet I was caught up in a nasty scene within the lampworking community. Lies were told about a lot of good people, including myself. When a few of us tried to shut it down we were sued. It took two years and about $100,000 (there were about 20 of us and we worked our butts off) but we were vindicated and able to walk away. But it had a lasting impact. A number of us, myself included, found ourselves unable to get back to work. For me, depression set in and it was a long time climbing out of that deep hole. But that, too, has passed. My workbench is dusted off, my propane tank hooked back up and the oxygen concentrators running again. I have returned to eBay (sort of), my Etsy shop is still open, and I am part of several selling groups on Facebook in addition to having a separate page for my work there. And I am looking forward to a whole new set of glass melting adventures!